This professional office building is unique in Klamath Falls. Its location is central to government buildings of both City & County as well as all major banking locations. It is designed to cater to the professional who does not have, nor need, their own support staff. The reception area is staffed between the hours of 8:30 AM to 5:00 PM; all clients of tenants are greeted and directed according to instructions of each tenant. The switchboard allows flexibility to incoming calls and the telephone hardware is included with the office space. Wireless internet server is installed within the building; tenants desiring connection pay an additional fee each month. A mail box for each tenant is located in the reception area; tenants bring their out-going mail to the receptionist who then weighs, posts and delivers it each evening to the post office. A copier and fax machine are located in the reception area. Each tenant is given 100 free copies each month; a minimum charge is made for each fax use. Any cost of postage, extra copies and fax use are charged to the tenant on the next month's billing statement. Janitorial service is performed each business day in all common areas of the building. Individual tenant office interiors are cleaned once each week at no extra cost to the tenant. The building is equipped with an alarm system; each tenant has a key for outside entry and is given instructions and a code which allows them 24-7 access to their office. The building has tangent parking lots; the prime tenant of each office will receive either a designated parking space or a permit for off-street parking. 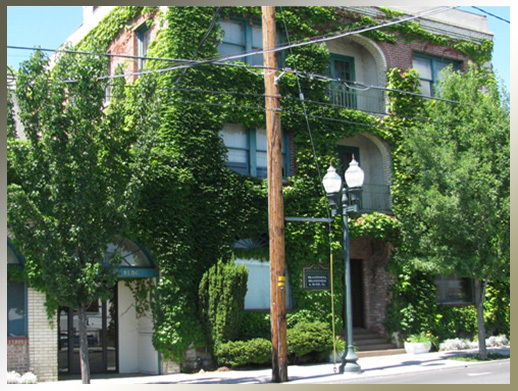 This office complex receives its unique character from the remodeling of a historic building of Klamath Falls. The renovation design was by Pedersen & Pedersen, AIA, occupants and partners in ownership. All rooms utilize the outer wall of brick, giving each room a very unique, warm appearance. Signage throughout the building is consistent to the established building design and is placed at the main signage board in the reception area, at the elevator lobby on the floor of the tenant's office and on the tenant's door. In addition to single room suites there are a few multi-room suites to accommodate tenants with larger office requirements. For further information regarding availability and specific rental rates please contact the receptionist at 541-882-2921 or fax 541-882-8819. She will be most happy to answer your questions and to fax you a copy of the standard month-to-month commercial lease for your review.